Plain T-Shirt Bags, White, 12" x 7" x 22"
Dimensions: 12" x 7" x 22"
Plain T-Shirt Bags, Dark Blue, 12" x 7" x 22"
Plain T-Shirt Bags, Dark Blue, 9" x 5" x 17"
Dimensions: 9" x 5" x 17"
Plain T-Shirt Bags, White, 5" x 3" x 15"
Plain T-Shirt Bags, White, 14" x 10" x 30"
Dimensions: 14" x 10" x 30"
Plain T-Shirt Bags, White, 20" x 10" x 30"
Dimensions: 20" x 10" x 30"
Plain T-Shirt Bags, Black, 12" x 7" x 22"
Plain T-Shirt Bags, White, 9" x 5" x 17"
Printed T-Shirt Bags, White, 0.65 Mil, 12" x 7" x 22"
Versatile and economical, our T-Shirt bags are sized perfectly for everyday items like gifts, toys, veggies and more! This strong high density gusseted bag resists punctures and tears plus has the large handles for easy carrying. 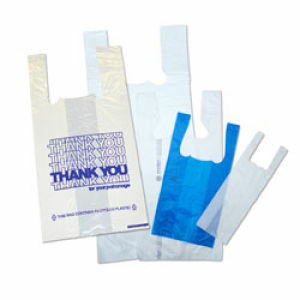 At American Retail Supply we offer our Plain T-Shirt Bags in 5 different sizes and 3 colors. For customizing options or to speak to a Product Expert about the T-Shirt bags, please contact American Retail Supply at 1-800-426-5708.